We have recently acquired new equipment to future diagnose, treat and educate our patients. Optomap ultra-widefield retinal imaging is a panoramic digital image of the retina that can show an 82% view of your retina at one time. - optomap facilitates early protection from vision impairment or blindness by allowing detection of problems more quickly and easily. It is completely comfortable and the scan takes less than a second. Our brand new Optovue OCT allows disease detection and monitoring many years earlier than visual symptoms are seen. 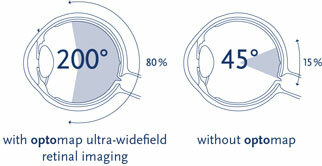 It is new ultrasound technology that provides a detailed view of the retinal layers, macula, and optic nerve. Our new retinal camera allows us to better diagnose and document diseases of the back lining of the eye called the retina. 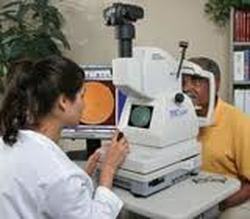 Some such conditions are glaucoma, macular degeneration and diabetic retinopathy. Our new anterior segment camera allows us to educate patients on conditions affecting the front of the eye including contact lens related issues, dry eye, allergies, sun damage and more.